Sarnia, Ontario, January 5, 2012 --- Enclosure manufacturer Intertec is making it easy to deploy advanced laboratory-grade instrumentation in the field with the launch of an explosion proof protection option. A new inert gas pressurization system allows its protective cabinets or enclosures to house laboratory-style equipment that is non explosion protected - such as analyzers and sensors - in IEC-Ex and ATEX Zone 1, 21, 2 or 22 hazardous areas. Intertec is known for offering an exceptionally broad range of field protection enclosures, which are constructed from high performance grades of GRP (glass reinforced polyester). The new inert gas pressurization option - InertSyst - extends the types of equipment that plant instrumentation engineers can install in these protective enclosures - providing an unmatched choice of enclosure styles and opening formats, as well as climate protection accessories. A unique aspect of the new Ex p system is that it is certified for use where a hazardous atmosphere might be created inside the enclosure - due perhaps to a hydrocarbon leak from the analyzer equipment - as well as more conventional situations where a potential hazard is caused by the atmosphere outside the enclosure. The certification also applies to the system as a whole. This means that Intertec can use the principle for virtually any application, without having to seek re-certification from approvals agencies. According to Martin Hess, CEO of Intertec, "The ability to deploy non Ex approved laboratory equipment in hazardous environments provides considerable flexibility for system installers. They are now able to place the equipment precisely where it is needed. And because Intertec issues the CE certificate of compliance, there is no risk of installation schedules being compromised by lengthy certification procedures." InertSyst - or inert gas purged system - works by maintaining a small overpressure inside the enclosure, in the order of 0.8 mbar, of an inert gas such as nitrogen or carbon dioxide. Many refineries and chemical facilities incorporate air separation plants to produce a source of nitrogen which is piped around the facility. If this is not available, the enclosure can be supplied from a standalone cylinder. The introduction of InertSyst extends Intertec's ability to provide explosion-proof enclosure systems, enabling it to help clients achieve site-wide standardization of field-based equipment and thereby reduce their total cost of ownership through easier procurement, maintenance and spares holding. 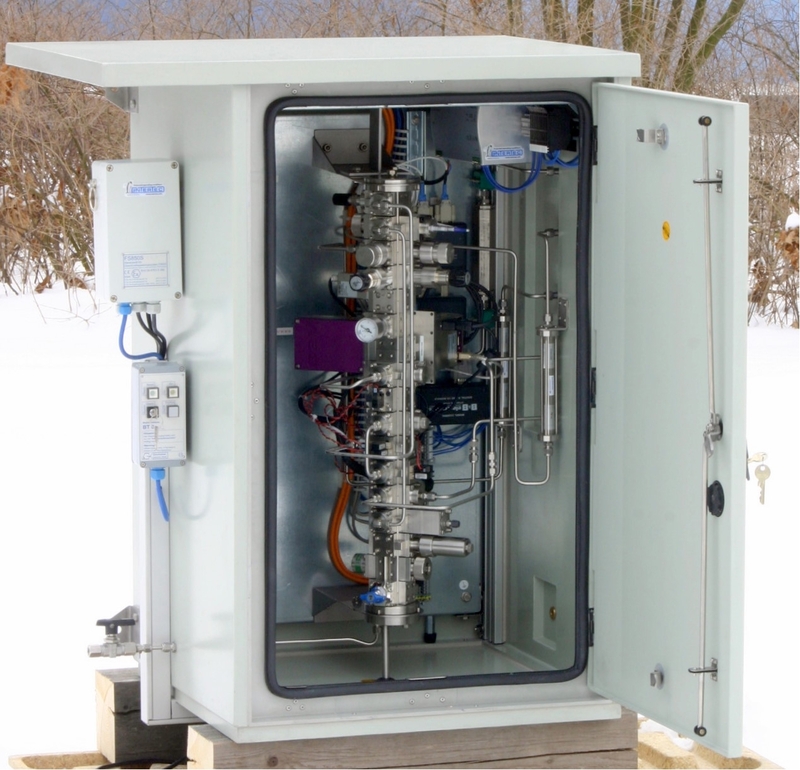 Intertec designs and manufactures probably the world's broadest selection of field protection enclosures and cabinets, and the new InertSyst gas purge system is suitable for use with most of these - up to sizes providing some 6000 liters (212 ft3) capacity. The technique can accommodate enclosures fitted with intrinsically safe heaters of up to 400 W dissipation, provided that they are designated T3 or T4 and are ATEX approved. Typically this would comprise an Intertec explosion-proof electric heater and smart controller combination. The inert gas is introduced via a solenoid valve, controlled by an application-specific electronics module which monitors internal and external pressure; the minimum and maximum internal pressures are programmable. Intertec offers a choice of digital (on-off) or proportional solenoid valves, to best suit the application. The nitrogen purging and pressurization process depends upon the particular application and its environment. For Zone 1 or 2 applications, where an external explosive gas or vapour atmosphere might be present, the enclosure is initially thoroughly purged with nitrogen to remove all oxygen before any protected devices are energized. Zone 21 or 22 applications, where the potential hazard is created by dust in the atmosphere, do not require this initial purging. Subsequently, provided that the instrumentation is not capable of leaking hazardous gas, the control module simply causes sufficient nitrogen to be injected periodically to compensate for natural leakage, maintaining a slight positive pressure inside the enclosure to prevent ingress of an explosive mixture. However, if the instrumentation is itself capable of compromising the integrity of the enclosure by leaking hydrocarbons, then the system has a continuous flow mode which continuously feeds a higher, but still carefully regulated, quantity of nitrogen through the enclosure to dilute the hazardous gas before dispersing it into the atmosphere. When fitted with InertSyst, Intertec's enclosures fully comply with the IEC EN 60079-2 standard for equipment protection provided by pressurized enclosures in explosive atmospheres. Intertec's new InertSyst is also available for cabinets and enclosures produced by other manufacturers. Intertec's new InertSyst explosion proof protection system enables non Ex approved laboratory-grade instrumentation such as analyzers and sensors to be installed in hazardous environments. Uniquely, the system is certified for use where the hazardous atmosphere might be inside or outside the enclosure.